Cumbria Tourism is throwing its weight behind a brand-new regional wedding fair to promote the Lake District as the ultimate romantic destination to tie the knot – and to bring the area’s wedding venues and suppliers together under one roof for the first time. The county’s Official Destination Management Organisation will be an official partner for the newly created Lake District Wedding Fair, which will take place in the Exhibition Hall at the J36 Rural Auction Centre near Kendal on 23 and 24 February 2019. Weddings are an important part of Cumbria’s £2.9billion tourism sector, but until now, there hasn’t been one single location where prospective brides and grooms can meet a full range of suppliers and hotel wedding co-ordinators face-to-face. Organised by event and show professional Nick Hood and experienced wedding organisers Joe and Agata Nichols, the team are taking a collaborative approach with support from partners across the region including Cumbria Tourism. 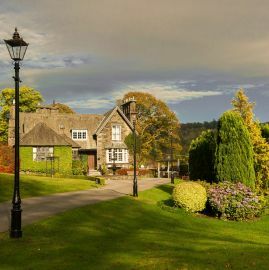 Winner of Cumbria Tourism’s Wedding Venue of the Year – the Broadoaks Country House Hotel in Windermere – was one of the first to snap up an exhibition stand at the event. It has already been joined by other renowned bridal venues from across Cumbria, including Armathwaite Hall near Keswick, Askham Hall in the Eden Valley and Kendal’s Castle Green Hotel. There will also be a wide range of suppliers, from bridalwear, cakes and flowers to photography, entertainment and specialist vehicle hire, along with a professional catwalk fashion show. Cumbria Tourism’s Head of Marketing and Sales, Rachel Tyson, says, “We’re excited about the prospect of a new event showcasing this magical place as the ultimate wedding destination. When it comes to weddings, Cumbria has it all; whether that’s a vow renewal with a sea view, a civil ceremony overlooking a lake or a dramatic reception set against stunning mountain scenery. For more information about exhibiting or visiting the Lake District Wedding Fair, contact: www.lakedistrictweddingfair.co.uk.